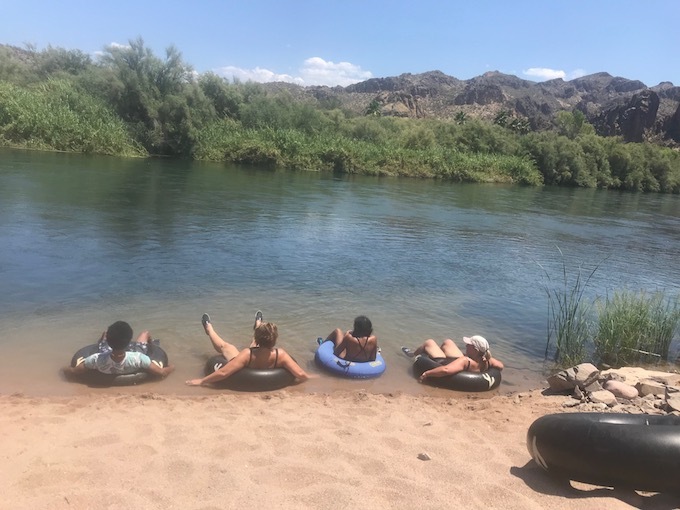 Tubing down the Salt River is a pretty popular thing to do out in Phoenix, Arizona. People flock to the river, rent inner tubes, ride a bus up to the top and then float for hours with two different exit points. 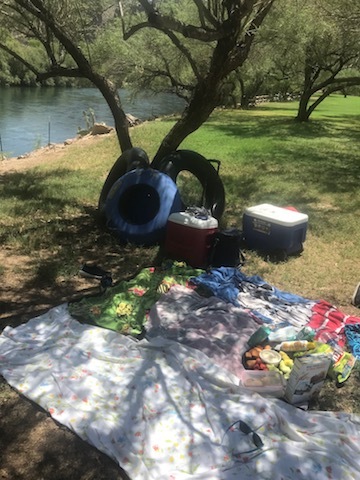 There are both calm relaxing parts to chill and eat the snacks floating beside you, (yes, your cooler can have its own tube! ), and crazy current rapids. From everything I learned and read about it, the river can get quite crowed with people and there is a lot of alcohol consumption, so you can guess the crowd’s personality! 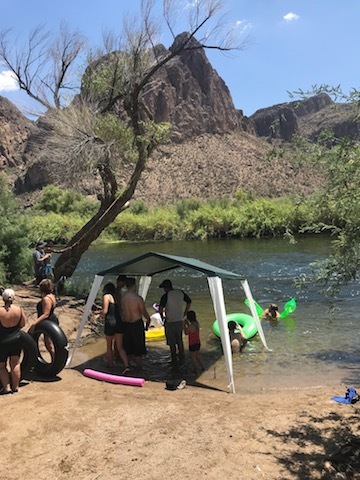 Lucky for us, I discovered a gem of a different place to do it at, that is not very well known, and that would be Salt River tubing at the Saguaro Lake Ranch. 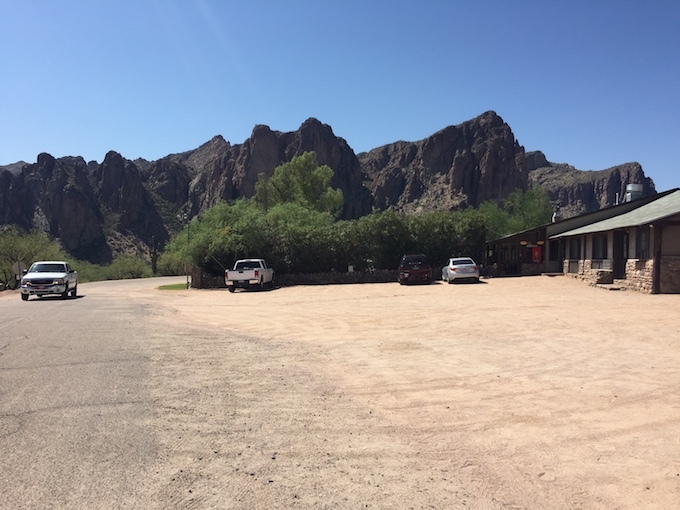 Arriving at the Saguaro Lake Ranch. This is the view from the parking lot. The office where you check in is on the right. 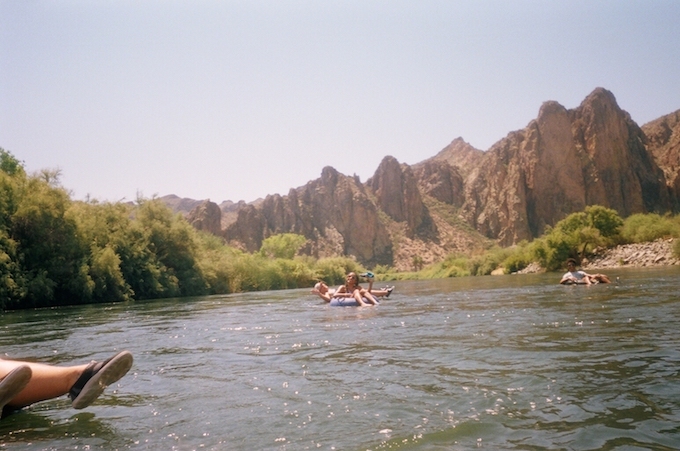 Tubing at the ranch begins at the very first mile of the Lower Salt River. This is the most scenic pristine part of the river! The ranch maintains it, so it is always clean and is a much more suitable experience for families to do together. Children must be at least 9 years of age though, and 4 feet tall. You are able to walk directly to the water and launch, without needing a bus ride to the starting point. The Launch Site ~ a short walk down the hill from the office. 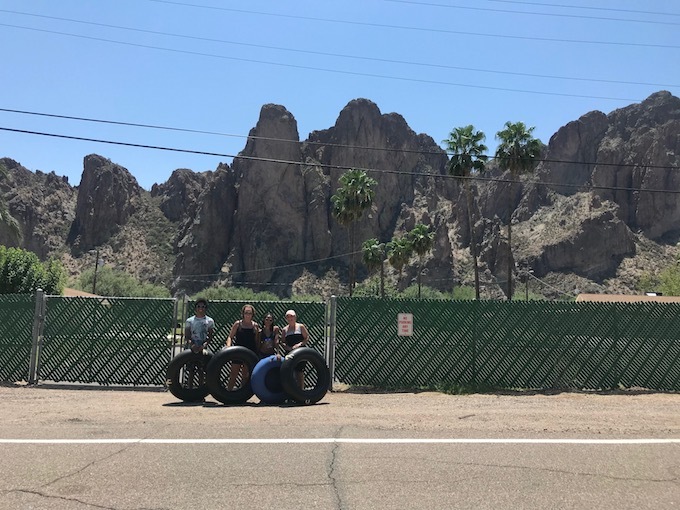 Before I found out about this option for tubing, I had completely frightened myself by reading too many reviews about the most widely used Salt River Tubing company’s location. Of course, these all involve injury and death, as the internet is prone to give you! Upon calling the Saguaro Lake Ranch, I was assured that their mile of the river is much more calm with some fast moving water and much smaller rapids, and this definitely turned out to be the case! Beautiful Water and Scenery! There were boys jumping off rocks and spear fishing, who chatted with us as we floated by. There are actually two options to choose for your river adventure. We chose option #1, which was the 40-minute to 1 hour tube. Let me paint the picture of what’s so spectacular about that! We were able to set up a picnic site at the launch area under shady trees (very important, as you are in the middle of the desert! 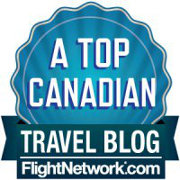 ), and leave our keys and valuables at the front desk. Everyone at the ranch is beyond friendly and helpful. 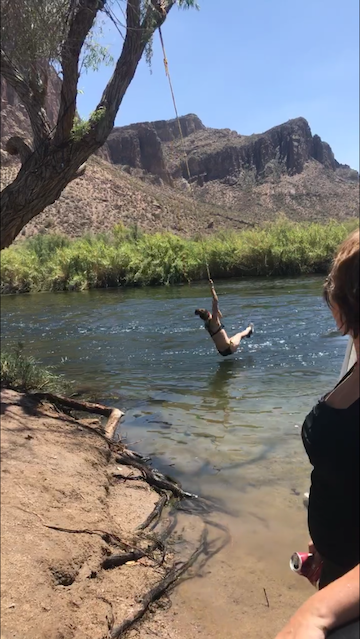 You get out of the river at a very tiny patch of beach with a rope swing hanging from a tree, where you can play for a while, and then you have a scenic walk back to your picnic site. You can then tube again and again as much as you want until 3 pm! 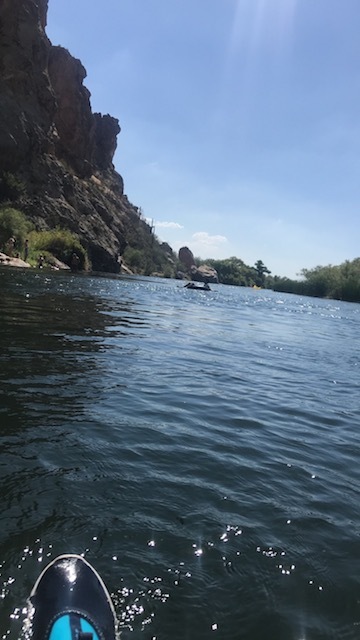 Option #2 is to actually start with the 40-minute to 1 hour tube, but not get out, and instead eventually join up with the tubers from the main route and float until exit point #2, where the ranch will have an air conditioned van waiting to drive you back. That would be about 3 hours in the water. This is the tiny beach where you exit the river. Don’t expect the tent to be there, this was a local family who set one up to enjoy their day. The water flows by quickly, so make sure you get over to your right during the last set of mini rapids. The guides who set you up before your tube, will explain the route well for you. We set off on our first tube run around 10:30 am, and with picnic stops and rests in between each one, we were able to get in 3 runs before 3 pm. We had a blast! 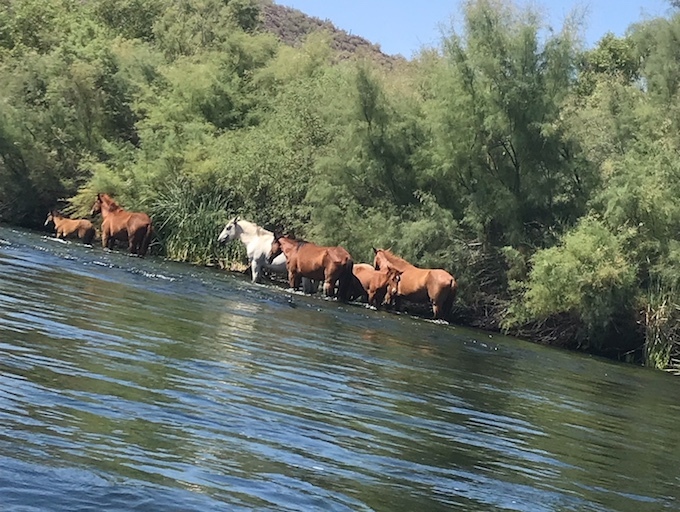 We were graced with the presence of wild horses, who stopped for a drink as we floated by! Bring plenty of sunscreen. Reapply after every tube run. Wear a hat. 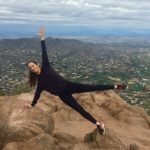 Not a necessity, but you will get a lot of desert sun. Tight fitting ball caps are best, so you don’t lose it as you float down the river. You may read other reviews that suggest bringing a towel or sheet to cover your tube with as they get quite hot. At the ranch they told us to just keep splashing the tube with water. The tubes are hollow in the middle so covering them prevents you from sinking well into the water, and sheets hang lower which can create an extra drag or can get grabbed and whip you around in the current. 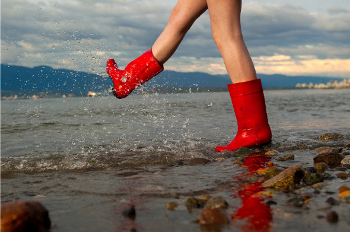 Wear water shoes, or other light tennis shoes that can get wet. The river has a rocky bottom so exiting would be too slippery without them, plus you have the walk back. 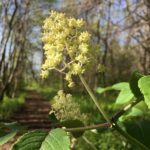 Be prepared to lift your tush up in the shallow places to avoid rocks and weeds. This is not too much of a concern. If you are able to, flip over and ride the tube on your belly on the slow parts so you don’t end up with a one sided desert tan! Bring a waterproof case for your phone to take photos on the water, or a dry bag. We purchased a waterproof disposable camera, but later found out that no one develops film anymore so we had to mail it out to get our photos back. 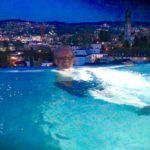 If time is not of the essence to see your photos, this can also be an option. Appoint a designated driver if you plan to drink. Alcohol and the sun and water make you feel the effects stronger and longer, so you will not be able to drive home.